Being a Tuesday, we had our weekly outage (database maintenance, backups, etc.). When we came back up today did you notice anything different? Hopefully not. But I did take one important step today. As of right now, workunits are being stored on (and therefore served off of) georgem's disks. So far so good. If all goes well, I'll make georgem the one and only download server (currently vader and anakin are still handling that task in tandem). We have been doing some testing with a new splitter, hence why a relatively small number of recently sent workunits are 2.8MB in size. Oops. These should behave normally, and yeild normal results, but will take 8 times longer to process. I also got a new RAID card (once again from the generous folks from the GPU User's Group) to put in paddym. We're still waiting on drives currently in use holding data taken at Green Bank to return to us (any day now) which we'll then put into paddym and start attempting to make it a science database server. One step at a time though. Message 1229224 - Posted: 8 May 2012, 21:34:50 UTC - in response to Message 1229216. Message 1229239 - Posted: 8 May 2012, 22:15:08 UTC - in response to Message 1229216. Thanks Matt! Yes we certainly noticed those large MB WUs, and they did behave normally, but they did not take (or even hinted that they would take) any longer than normal MB WUs. Those that did not end early with -9 result_overflow, didn't run any longer than a normal WU either. I have noticed that several of my machines are over the 50/CPU in progress limit. Were the limits removed/changed as well, or is this an unplanned event? 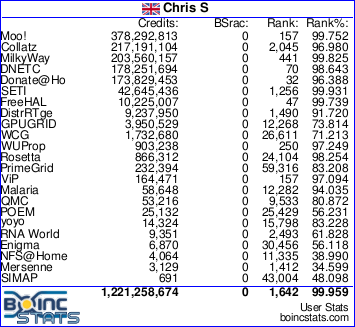 My BOINC have since after the maintenance over 400 (currently 467) WUs for the GPU downloaded/ready for calculation.. Thanks for the update. Doing a fine job. Message 1229615 - Posted: 9 May 2012, 17:40:39 UTC - in response to Message 1229216. We're still waiting on drives currently in use holding data taken at Green Bank to return to us (any day now) which we'll then put into paddym and start attempting to make it a science database server. One step at a time though. can I have more explanations and data on that ? Message 1229620 - Posted: 9 May 2012, 17:53:00 UTC - in response to Message 1229615. Basically the JBOD drives slated for PaddyM's machine were sent off to Greenbank to collect telescope data. They should be back in this week. Once they're back they'll be mounted into the JBOD at which point PaddyM will become the new science database server if everything works like it should. At that point Oscar will become the new compute server PaddyM was slated to be. Both servers are fairly similar in specs so this should work out great for the lab. 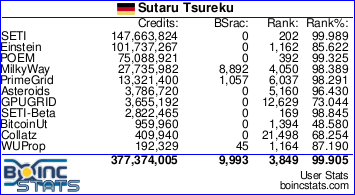 Message 1229625 - Posted: 9 May 2012, 18:01:08 UTC - in response to Message 1229620.
but what we will do with these telescope datas ? Message 1229628 - Posted: 9 May 2012, 18:03:29 UTC - in response to Message 1229625. Same thing we do every cycle, look for ET and similarly interesting radio phenomena. Message 1229711 - Posted: 9 May 2012, 20:57:53 UTC - in response to Message 1229620. Once they're back they'll be mounted into the JBOD at which point PaddyM will become the new science database server if everything works like it should. At that point Oscar will become the new compute server PaddyM was slated to be. What's the reason for that change? Message 1229732 - Posted: 9 May 2012, 21:48:27 UTC - in response to Message 1229711. Oscar can't connect to the JBOD due to compatibility issues. In light of this, the guys are just changing the planned roles of Paddy/Oscar. GeorgeM will be the new download server. This will replace vader/anakin and if all goes well it may end up replacing Bruno, the upload server as well. PaddyM can connect to the JBOD and in light of this, will become the new science database server if everything goes right. Oscar will then turn into the compute server. Oscar currently has 144GB of RAM with paddy at 132GB and they're fairly similar in composition. The swap really is a minor one all things considered. Message 1229952 - Posted: 10 May 2012, 10:43:51 UTC - in response to Message 1229628.
but its nothing to do with kepler candidates, no ? Sums the current situation up nicely Slavac, many thanks. Message 1230007 - Posted: 10 May 2012, 14:08:46 UTC - in response to Message 1229952. Sorry but I don't know what's on the tapes aside from telescope data. ETA you bet Chris. I'm always happy to answer questions when they reference what we're up to. Most of the time I have to defer to the Lab but I can answer some simple stuff like the above. Message 1230120 - Posted: 10 May 2012, 18:55:41 UTC - in response to Message 1230007. As far as I know Greenbank is the kepler project candidate stars data. The last I heard from staff is to analyze this data a new science application will need to be written as the data formats are different as different equipment was used to record them than @ Arecibo.